I am, it’s fair to say, something of an Arthur Schnitzler fan. I’ve previously reviewed his Fraülein Else and his Dying, and loved both. When I heard that Pushkin Press were releasing a previously unpublished Schnitzler novella I lost no time asking for a review copy. As a rule, I’m fairly suspicious of posthumous releases of unpublished work. All too often the result is some half-finished manuscript which the author discarded as not up to scratch but which was then slapped together after their death even though it’s perfectly evident it wouldn’t ever have been released in their life. In this case, that suspicion would be totally unwarranted. Late Fame is quality Schnitzler, and as the excellent afterword makes plain was in fact very likely intended for publication in pretty much its current form. Pushkin Press have done both Schnitzler’s memory and his fans proud. Edward Saxberger is an elderly civil servant, not yet retired but comfortably settled in his department and his quietly ordered life. Years ago, in his youth, he wrote and published a small poetry collection titled Wanderings. It didn’t make much of a stir and after a little while he gave up his literary career and became the stolid and reliable civil servant that he is today. Now (the book was written in the 1930s) a young man named Wolfgang Meier comes to Saxberger’s rooms seeking him out as the long-lost author of Wanderings. To Saxberger’s amazement Meier talks of how his artistic circle have discovered Saxberger’s work and been inspired by it; how they were delighted to learn he still lived; and that they believe the time has come for Wanderings to gain the recognition so long denied it. Before long Saxberger is part of Meier’s set – a group of young writers and intellectuals based loosely on Schnitzler’s own similar early circle. Meier is himself a poet, but they also have a critic, a playwright, an actress and more. They all hail Saxberger as a giant come to walk among them and even more they claim him as a spiritual companion and inspiration. Saxberger finds himself replacing dinners with his long-standing friends and peers and their talk of business and politics with dazzling late night discussions of art and ambition. Saxberger’s a sober man and his literary aspirations were long ago put to bed, and yet it wouldn’t be human not to be excited by this new attention. He’s cautious naturally, but what if he was overlooked? What if they’re right and now, after all these years, he’s finally being recognised? Who wouldn’t be tempted by such an extraordinary second chance, so unlooked for and so unexpected? Meier and his group are organising a recital evening at which they will present various works from their movement and they want Saxberger to write new poetry for the occasion and to showcase it with them. It’s a dizzying prospect, but Saxberger finds that it’s harder than he thought to pick up his pen again, and he’s not entirely sure he understands the work his young compatriots are producing. Does he still have talent, if he ever did? Do they? Could he still be relevant? Will the audience proclaim him a lost master or will they laugh? With his artistic dreams rewoken Saxberger finds himself caught between identities: the staid but comfortable complacency of his place among his aged peers with their careers in government or industry; the thrilling but perhaps fleeting recognition of him as an artist but only among people more than thirty years his junior. Saxberger no longer feels he fits in the world he’s come to inhabit, but he’s not a twenty-something just setting out either. In lesser hands Late Fame could easily be a cruel novel. Schnitzler, however, walks a fine line between comedy and tragedy. Saxberger is a likable protagonist and his pleasure at being (re)discovered is palpable, as are the practical difficulties of his position. The young artists are passionate, deadly serious and full of their own importance as of course they would be. They assuredly had a great deal of talent between them; work, however, was something they actually did very little of. Here, Saxberger is in a café with them and notices them exchanging sharp glances at another very similar looking group. “Who are those people?” asked Saxberger of Meier. “Why do you call them talentless?” asked Saxberger, persevering. “I’m writing an article about it,” said Blink, his demeanour suggesting that this would dismiss them once and for all. Note that in the above quote there’s a said, but before that some askeds, a mocked, an interjected and a shrieked. There’s an often quoted writing rule that you should only ever use said, not exclaimed or proclaimed or asseverated or whatever. It’s like most literary rules, fine for some kinds of writing, but far from a requirement for all as I think Schnitzler demonstrates. Schnitzler succeeded in making me care for Saxberger, even sympathising with his growing but easily understood vanity. That empathy made this at times an oddly tense novel, since I found it difficult to imagine Saxberger suddenly being hailed as a major new discovery by anyone beyond his new circle. They title their evening Enthusiasm, and it’s easy to see him as just another enthusiasm they’ve briefly picked up and might just as lightly put down again not considering the damage they could do. Late Fame doesn’t have the technical daring of Fraülein Else or the implacable awfulness of the situation in Dying, which I suppose could arguably make it a lesser work. Better though perhaps to see it as a gentler novel than either of those; a Sunday afternoon book to be read with a coffee and slice of strudel but still shining with Schnitzler’s characteristic psychological acuity. Late Fame comes in a physically gorgeous hardback edition which fits neatly in hand or pocket and is just tremendously well put together. The translation is fluid and readable (though since I know no German I can’t speak to its accuracy), and the afterword is both fascinating in its description of how this manuscript was so nearly lost and yet finally came down the years to us and insightful (particularly in picking up subtle psychological elements that would I suspect be more obvious to a contemporary reader familiar with Freudian theory than a modern one for whom that’s largely historic). The whole package is a delight. I’m sure I’m missing several, but the ones I have noted are from Kaggsy at Kaggsy’s Bookish Ramblings here and from Lizzy Siddal at Lizzy’s Literary Life here. As ever, if you know of others please let me know in the comments. Robert Musil is famous (being a bit generous with that word there for a moment) for his unfinished novel The Man Without Qualities. By all accounts it’s an incredible work. I’m too fond of editors to ever welcome the idea of reading an interrupted book – one that not even the author finished polishing – but I’ve been told that for Musil I should put that prejudice to one side. Fair enough, but The Man Without Qualities has another barrier besides being incomplete. It’s nearly 700 pages long. That’s a lot to launch into with an author I don’t know. Enter Penguin Modern Classics with their pocket editions each coming in at around the 60 page mark. 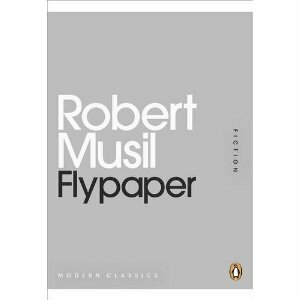 Flypaper is a collection of fueilletons, short essays, by Robert Musil. There’s nine of them in this tiny collection, and as an introduction to Musil it’s about as good as it could be. That’s the joy of these little Penguin editions. They cost almost nothing, they’re concise and they’re a tremendous way to try out an author who for one reason or another you might be unsure about investing in. Each of the nine little pieces in this collection is a small marvel of mercilessly precise observation. The title narrative, Flypaper, consists of a description of a piece of flypaper and the slow death of the flies that land on it. It’s at times hard to read. Partly I admit because I had nightmares about flypaper as a child (someone unwisely left some above my bed at a relatives home, meaning I had a front line view of exactly what Musil describes here. Whether that caused the peculiar horror I still have of the sight of dying insects or whether that fear already existed and so made the flypaper terrible I have no way of knowing). Partly though because Musil takes something as insignificant as the death of a fly and by not looking away invests it with majesty and with a more universal significance. Tangle-foot flypaper is approximately fourteen inches long and eight inches wide; it is coated with a yellow poison paste and comes from Canada. When a fly lands on it – not so eagerly, more out of convention, because so many others are already there – it gets stuck at first by only the outermost joints of all its legs. A very quiet, disconcerting sensation, as though while walking in the dark we were to step on something with our naked soles, nothing more than a soft, warm unavoidable obstruction, and yet something into which little by little the awesome human essence flows, recognised as a hand that just happens to be lying there, and with five ever more decipherable fingers holds us tight. Musil then explores the flies ever tiring attempts to free themselves, each miring them more firmly to the paper. He talks of moments of furious struggle, of sudden exhaustion, of the slow despair and futility of a fight against inevitable disability (as wings and limbs become stuck fast) and death. There is real empathy here, and it is the empathy which makes it so awful. The next, Monkey Island, examines a small island in the heart of Rome. A wide and deep ditch separates the island from the land around it, and on it is a tree and a colony of monkeys none of whom can quite jump or climb that ditch. This then is the monkeys’ kingdom. Musil’s gaze sweeps over it, from the strongest monkeys who form the royal family of the island to the outcasts who live within the ditch itself. It is a microcosm of us, a point Musil has no need to underline but which cannot be avoided as he shows the social and literal gulf dividing those monkeys who have from those who feed from fallen crumbs. I won’t describe each essay. They are superbly written. Some, like those first two, draw out uncomfortable truths about our own existence. Some, such as The Painstpreader or It’s Lovely Here are satires, of artistic mediocrity on the one hand and of tourists’ desire to encounter “something that is acknowledged by experts as beautiful” on the other. The briefest piece, titled Sarcophagus Cover, is a touching description of two ancient Roman sarcophagi that have on them a couple still gazing affectionately at each other through the long centuries. The last, The Blackbird, is a sort of fable different in nature from all that has gone before. Not so much an essay as an example of his fiction, but no less finely crafted. Musil has range. This next quote is an entire piece, albeit a very short one. I hesitated to quote it, since after discussing Flypaper and Monkey Island there’s a risk of giving the impression that Musil only focuses on the cruel. That’s not true of course. What Musil focuses on is the world. On the beach they’ve dug out a little pit with their hands, and from a sack of black earth they’re pouring in fat earthworms, the loose black earth and the mass of worms make for an obscure, moldy, enticing ugliness in the clean white sand. Beside this they place a very tidy looking wooden chest. It looks like a long, not particularly wide drawer or counting board, and is full of clean yarn; and on the other side of the pit another such, but empty, drawer is placed. The hundred hooks attached to the yarn in the one drawer are neatly arranged on the end of a small iron pole and are now being unfastened one after the other and laid in the empty drawer, the bottom of which is filled with nothing but clean wet sand. A very tidy operation. In the meantime, however, four long, lean and strong hands oversee the process as carefully as nurses to make sure that each hook gets a worm. The men who do this crouch two by two on knees and heels, with mighty, bony backs, long, kindly faces, and pipes in their mouths. They exchange incomprehensible words that flow forth as softly as the motion of their hands. One of them takes up a fat earthworm with two fingers, tears it into three pieces with the same two fingers of the other hand, as easily and exactly as a shoemaker snips off the paper band after he’s taken the measurement; the other one then presses these squirming pieces calmly and carefully onto each hook. This having been accomplished, the worms are then doused with water and laid in neat, little beds, one next to the other, in the drawer with the soft sand, where they can die without immediately losing their freshness. It is a quiet, delicate activity, whereby the coarse fishermen’s fingers step softly as on tiptoes. You have to pay close attention. In fair weather the dark blue sky arches above, and the seagulls circle high over the land like white swallows. The phrases there. “A very tidy operation.” The fishermen with their “kindly faces” impaling the worms. The transition from fat life to “squirming pieces” and the tidy convenience of the sand-filled drawers. The fingers that “step softly as on tiptoes”. Marvellous imagery culminating in that final vision of freedom and beauty and utter indifference. To the fishermen the worms are no different to the hooks or the drawers; the gulls are part of their scenery, as they are to the gulls. I’ve not commented on the translation. Obviously I’m not familiar enough with German to read the original (or I would have), so I can’t say how faithful this is. I can’t say that of any translation really. Still, the language is spare and precise and beautiful and I can’t believe but that Wortsman has done an excellent job here. The point, as I understand it anyway, of the Penguin pocket editions is to tempt readers to try new writers. For me it’s worked. I’ve tried Musil, who I knew about but was daunted by, and I’m no longer daunted. I plan now to pick up a copy of his short novel The Confusions of Young Torless and that going well I think The Man Without Qualities is looking a lot more enticing than it once did. Well done Penguin. The county courts of this region were very busy. The county courts of this region had a lot to do. There were, for instance, certain types of men who allowed themselves to be slapped, voluntarily and with relish. They possessed the great art of provoking other men who, for one reason or another, were ill disposed towards them, until they received a slap in the face. Whereupon they went to the local doctor. He confirmed that they had been injured, and, sometimes, that they had lost a tooth. This was known a a ‘visum rapport’. Whereupon they sued. They received justice and damages. And on this they lived for years. And yet they still managed to live, despite everything – for God helps the poor. He bestows a little compassion on the rich, so that from time to time one of them comes and buys something which he does not need and which he will throw away in the street. Once upon a time in the District of Zlotogrod there lived an Inspector of Weights and Measures whose name was Anselm Eibenschütz. That’s the first sentence of Weights and Measures. Those first four words are among the most iconic in storytelling. Immediately they create a sense of distance but also of the fabulous. Here they are the precursors to a story about a local government inspector’s marital problems and his attraction to a local criminal’s woman. What could be fabulous in that? Herr Eibenschütz, the inspector, is a former artilleryman who resigned his service in the army at the urgings of his wife. He had married, as almost all long-serving non-commissioned officers are in the habit of doing. Ah, they are lonely, the long-serving non-commissioned officers! They see only men, nothing but men! The women they encounter flutter past them like swallows. They marry, the non-commissioned officers, to keep hold of at least one swallow, as it were. I thought that the most beautiful of images. It shouldn’t really work as a paragraph. It contains a great deal of repetition (as do several other passages). Even so it does work. It reads like a fairy story; a fable. It captures a palpable sense of loneliness and the sheer need for another human being to call one’s own. Eibenschütz sadly did not choose his swallow well. He was happy as an artilleryman and is less so as an inspector of weights and measures. He doesn’t even work for the central government as he is entitled by virtue of his old rank, but only for the local municipality. He takes his task seriously though and travels through the district accompanied by his imposing gendarme checking the honesty of the local traders and shopkeepers. It is unfortunate that they are all dishonest and that none of them has an accurate weight or measure save those they save for his visits. The old inspector was not so scrupulous in his duties. Eibenschütz then is an honest man in a land of thieves. All are corrupt save him and this does not make him loved. At home things are little better. He captured his swallow, but not love. For a long time now he had made a habit of going to sleep as soon as they climbed into bed at night, into the two beds pushed closely together, and he no longer spared a glance for her naked body as she undressed before the mirror, perhaps in the hope that he might desire her still. Sometimes she asked him, standing there naked, whether he loved her. She really meant whether he found her beautiful. ‘Yes, of course!’ he said and yielded to sleep, not least to escape the pangs of conscience which his lie might yet produce. There’s an extraordinary air of melancholy to this book. It opens with Eibenschütz married. His happiness in the army and his loneliness at being without a companion are both already past. Much worse though than being alone is being with someone for whom you have no feeling. This is a book suffused with loneliness. Soon Eibenschütz suspects his wife of having an affair. She seems too happy and too beautiful. Here only the illicit are ever happy. Rectitude has no rewards. Suddenly, too, he saw how she had altered. A new, large, tortoise-shell comb held the knot of her thick dark-blue-gleaming hair together. Large golden earrings which she had not worn for a long time, earrings on which dangled tiny delicate golden discs, trembled on her earlobes. Her dark-brown countenance had recovered quite a youthful, indeed a maidenly, ruddy hue. One might say that she looked again as she had looked in the past, as a young girl, when he had first met her in Sarajevo, where her uncle, the master-at-arms, had invited her for the summer. I won’t say too much more. Eibenschütz discovers the identity of his wife’s lover and and learns that she is pregnant by him (he realises when from nowhere she speaks of how good it would be for their marriage to have a child). His home is no longer welcoming. “Not even the cat would come up to him, as it had done in former times, and allow itself to be stroked.” In his sorrow he takes to frequenting a border tavern owned by the notorious outlaw Jadlowker. It is there that he sees the gypsy woman who shares Jadlowker’s bed, and becomes infatuated with her. As plots go this one couldn’t be much simpler. It’s a story of love, rivalry and infidelity. There is nothing original to it. It does not aim for originality. What there is though is a clash of ways of life. Eibenschütz is an agent of the state. He tries to impose its rules on a region where by his standards normality is crooked. Jadlowker lives on the border. He is rumoured to have murdered a man in Odessa with a sugar-loaf. He is Eibenschütz’s opposite. He is chaos and lawlessness. He is on the boundary between civilisation and a great dark forest beyond which lies another world (or, more prosaically, Russia). Like the Austro-Hungarian Empire itself Eibenschütz tries to impose order where there is no place for it. It is in a sense a heroic enterprise, but it cannot succeed. Jadlowker by contrast is free. He has no government to report to and no morality. His freedom is a freedom to do what he wills. He is a killer and a thief. Roth makes the district of Zlotogrod breathe. He captures its customs such as the way the people rush out in the middle of the night to celebrate the arrival of spring; heralded by the first cracks appearing in the ice which each year coats the local river. The government is far away and they have their local doctors and local courts and when a man needs order he goes to one and when he needs freedom he goes to Jadlowker’s. The heart here though is Eibenschütz. As he falls genuinely in love with Jadlowker’s gypsy he begins to notice the world about him. He notices the birds singing in the spring and their absence in the winter. He notices the stars overhead and how they seem not meaningless lights as they used to but friendly companions in the night. Nature and the cosmos both change to match the moods of Eibenschütz, Jadlowker and others. At first I thought the matching of nature and mood thematic. I thought Roth was choosing for the seasons and the sky to follow the narrative. Then I realised that he was doing nothing of the kind. Nature and the sky remain unchanged throughout the book save that the seasons turn as they always do. Men just change their interpretations according to their sentiments and find meaning where there is none. 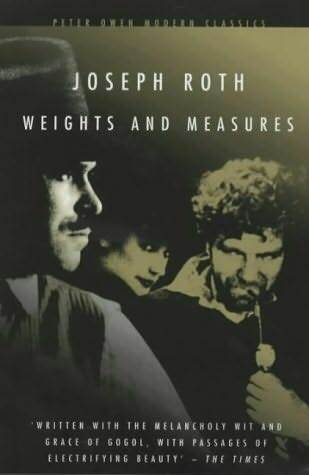 Weights and Measures is a fable, but it is a dark and sly one. The world here seems suffused with meaning, but gradually it became apparent that the meaning was only ever that which the characters gave it. It was written in 1937 and it contains no hope. The best that can be achieved in Zlotogrod is to leave it. This is not a well known Roth. I found few reviews of it online and it hasn’t the recognition factor of Hotel Savoy, The Radetzky March or The Legend of the Holy Drinker. It’s not one of his major works. It is, however, beautiful and haunting and superbly written. I’ll finish with one final quote. Here Eibenschütz’s gendarme has been speaking of his own troubles after hearing of those of Eibenschütz himself. Eibenschütz had long since ceased to listen. But it did him good that a man was speaking beside him, just as it sometimes does one good when the rain is pouring down, even if one does not understand the language of the rain. The language of the rain. Roth shows a world which is venal and mundane and then makes it fabulous through the sheer beauty of his art. I intend to write a post soon about my personal canon; the works I consider central to my concept of literature. Roth will be on it. The copy of Weights and Measures I read was published by Peter Owen Classics and translated by David Le Vay. Given how the language sang I’ll look out for Le Vay’s translations in future. Update: 25 November 2014. Caroline of Beauty is a Sleeping Cat has now also reviewed this. Her excellent review is here. I recently asked a commenter on a Guardian thread for some recommendations for Central European fiction, which she (I believe, though I could be wrong) kindly provided in the comments to my second Yoshimura review. I thought the comments worth pulling out into their own post, for my own ease of reference and in case anyone else was interested. sorry to switch to your blog from the Guardian post, but I did not want to take the conversation into another (from my point of view: selfish) direction. You’ve asked about some recommendations on Central-European lit; I have mentioned Péter Nádas there – he is very postmodern and pretty demanding (but very rewarding). However, his first translated work, The End of a Family Story, is quite accessible. In the more traditional line (following your Kosztolányi and Szerb line) Attila Bartis is a good start; his novel, Tranquility, won the best translated book (in the US) award a couple of years ago. Then there is Embers by Sándor Márai – I am not a big fan of his, but have to admit he is an excellent writer (died in the 80s but he did not write anything for decades (!) before his death). The Book of Fathers by Miklós Vámos is an excellent novel on the near-past of Hungary. And of course, Fateless by Imre Kertész, who won the Nobel prize for Lit for this Holocaust work of his. And there are others as well from the region (I stayed with the Hungarians this time), but I do not want to provoke your patience. The only one of those I know is Embers, so I’m delighted to have this list. Kinga, in case you see this please do provoke my patience, I’d be delighted to hear more and from neighbouring countries. There are some books I don’t want to write about. Instead, I just want to quote them. Passage after passage. These are books where once I finish them I have to accept that there’s nothing I can say about them that a quote wouldn’t say far more eloquently. But, this wouldn’t be much of a blog entry if it were just a series of quotes. So, even though what I have to say is redundant in the face of Kosztolányi’s prose, I’ll add to his words with some of my own. Skylark is a Hungarian novel written back in 1924, shortly after the end of the Austro-Hungarian empire. It’s set in 1899, during the last flower of that empire. It’s translated by Richard Aczel who has either done a wonderful job or is a gifted writer in his own right (or both) and it is here published by NYRB Classics. Skylark is a 35 year old woman, which means she is no longer young by the standards of her time and culture. She is unmarried and lives with her elderly parents. The reason she is unmarried is a simple one: she is very ugly. Skylark and her parents live their quiet lives in a provincial town. They seldom go out and have few visitors. Over the years, Skylark’s blighted hopes of marriage have led them to retreat into their own unit. They are self-contained, and perhaps happy. Change comes though when Skylark goes to spend a week with relatives in the country. Skylark cooks for her parents and in her absence they must go to the local restaurants. That means her parents reenter the social world, and discover that it is not as bad as they have been reassuring themselves. As plots go it’s hard to find many less dramatic. Here an elderly man being welcomed back by old dining companions is a major event; a trip to the theatre equally so. The Dreyfus affair trundles on in the background, but Budapest is far away and Paris even further. In Skylark’s town of Sárszeg time seems to stand still. Things are as they seem they always have been and perhaps as they always shall be (though the reader knows 1914 is not far distant). Not to put too fine a point on it, I thought Skylark a quiet masterpiece. That’s a big word, and not one I use often. Still, Kosztolányi earns it with a book that dazzled me with the calm precision of its prose and the deadly accuracy of its observations. I should perhaps caution that others are less taken. John Self of The Asylum commented that although he had read it he had found nothing in it sufficiently interesting to merit a blog post (that’s not a direct quote, but hopefully is broadly accurate). I wrote recently about the chemistry between a book and a reader, for John clearly it was lacking here. Not so for me. The dining-room sofa was strewn with strands of red, white and green cord, clippings of packing twine, shreds of wrapping paper and the scattered, crumpled pages of the local daily, the same fat letters at the top of each page: Sárszeg Gazette, 1899. Beside the mirror on the wall, in a pool of bright sunlight, a calendar showed the day and the month: Friday 1 September. And through the window of an elaborately carved wooden case, the sauntering brass hands of a grandfather clock, which sliced the seemingly endless day into tiny pieces, showing the time: half past twelve. Mother and Father were busy packing. Reading that I know where I am: Sárszeg. I know the year, the month and even the day and the hour: half past twelve on Friday 1 September, 1899. I know that someone is going away, but the reference to the clock lets me know too that the days are not normally so eventful. Also of course I know that the couple here, Mother and Father, are defined by reference to a child. Father wore a mouse-grey suit, the exact colour of his hair. Even his moustache was the same light shade of grey. Large bags of crumpled, worn, dry skin hung beneath his eyes. Mother, as always, wore black. Her hair, which she slicked down with walnut oil, was not yet altogether white, and her face showed hardly a wrinkle. Only along her forehead rant two deep furrows. Two short paragraphs, yet containing so much. There’s a sense for me of disappointment and of a withering. Those deep furrows speak to me of sorrows endured. One of the many great joys of Skylark is Kosztolányi’s character portraits. As well as Mother and Father, and Skylark herself of course (of whom more shortly), there are people such as a young man whose “summer pimples bloomed brightly like ripe cherries” and a waitress “as pale as a damp bread roll.” This is prose that for me is a joy to read. The room had once looked like a chapel, chaste and white. But the paintwork had faded with time and the silk cushions had grown soiled and a little grey. In the cupboard stood empty cosmetic jars, prayer books from which the lace trimmings of devotional pictures protruded with German inscriptions, velvet-bound ornamental keepsake albums, fans scribbled thick with names, ball programmes, perfume sachets and hairpieces hanging from a length of string. Beside the door in the darkest corner of the room, facing north, hung Skylark’s mirror. Well, I said at the beginning of this piece I wouldn’t just quote. It really is hard not to though on this occasion. The tragedy at the core of the story is swiftly apparent from the quotes above (all of which save the waitress come from the first thirty pages). Skylark’s ugliness has denied her an exit from the family home, but her presence has foreshortened her parents’ lives so that now they live together wrapped in a web of illusory comfort. Their existence rolls down the years, like the town of Sárszeg there seems a timeless quality to their lives. Father spends his days on genealogy, heraldry and tidying his affairs (“The last years of his life he spent increasingly in preparation for his death.”), Mother looks after the Home and Skylark looks after them both. They are complete. With Skylark absent and the parents forced out of their small existence for the first time in years, the view shifts outwards taking in the wider life of Sárszeg. Father dines with the Panthers, the town’s drinking society who count the success of a night by how many times after it a man vomits. He takes Mother to the theatre where they are astonished by the wit and skill of the local players (who to the reader’s eyes seem woefully provincial). Father begins to enjoy a drink again, and a cigar. Mother buys a new bag. Their lives are flowering. The question this raises is whether the break in routine created by Skylark’s brief absence marks a real chance of change in all their lives, or whether this is simply an Indian Summer before the final onset of autumn and winter. Skylark is a novel with a powerful sense of wasted and frustrated lives. Skylark and her parents smother each other in the prison of their mutual love. A local poet writes to fashionable magazines but they do not print his works. The happiest here are those without ambition. The local fire chief and social lion of the town is delighted with life in Sárszeg as it is. He has no unmet goal and sleeps content. It is only those who reach beyond what is on offer who are unhappy. All of which makes this sound a profoundly depressing novel. Well, to an extent certainly at times it is. It’s also though shot through with a lively wit and a fine comic touch which makes some scenes extremely funny. I spoke earlier of being dazzled by it, that’s because so often it sparkles. I adored this book. For me, it was a perfect combination of prose, tone, wit and observation. I’ll be seeking out more Kosztolányi. Time I think for a quote from a different source, this one from Trevor Berrett of The Mookse and the Gripes whose own review alerted me to this marvellous novel. Nor can I, and I thank Trevor again for his recommendation. For those wishing to read more, after reading Trevor’s review I found that Guy Savage over at His Futile Preoccupations had also covered it. His review is here. Both he and Trevor have insights that I found extremely valuable (and which I avoided rereading while writing this, so I’m off to look at them again now). A final quote from Skylark. Three sentences that for me encapsulate the essence of the book. Nothing had been settled or resolved. But at least they had grown tired. And that was something. On Sunday I went to my first literary event. I’m not as a rule interested in readings or signings and I tend to think that if a writer has something interesting to say to the public it’s probably already in their books. It takes a fair bit then to catch my interest. All that said, when the London Review Bookshop (my favourite bookshop) holds a panel discussion on Central European classics (another favourite) I’m there. The panellists were Hungarian poet and translator George Szirtes, poet and translator Michael Hofmann, Czech author Tomáš Zmeškal and Penguin editor Simon Winder (responsible for publishing the Central European Classics range). Each of them spoke about one of the classics in the Penguin lineup and talked too about Central European literature more generally. I’m not going to repeat the entire discussion. It was 90 minutes long and I don’t recall every detail. I can say though that they made their cases well. I already knew I wanted to read The Cowards, but before attending I had no intention of picking up Faludy’s My Happy Days in Hell or Bernhard’s Old Masters. It was interesting to learn that Simon Winder had wanted the range to include essays, memoirs, short stories and novels. He didn’t want it to be just a way of pushing some lesser known writers, but more an introduction to the range of Central European writing available. It was interesting too to learn how much chance played a part in who was selected. It wasn’t that anyone was undeserving, but for some authors there weren’t the translations available, for others another publisher already had the rights. Generally it was a good humoured and intelligent event. George Szirtes was on particularly good form, arguing that the resigned shrug was Central Europe’s great contribution to human civilisation and explaining that Krudy was so influential in Hungary that books with a nostalgic fin de siècle air are described as being Krudyesque. There wasn’t time for a lot of questions. I asked one on the links between Austrian and Central European fiction which revealed the cheering fact that Austria is increasingly looking to Central Europe to rediscover old literary links severed by the second half of the twentieth century. A question on the influence of English literature led to comments on the importance of Byron on the region (something I had no idea of), though current English fiction has much less impact (US more, probably because the US novel is in my view in better shape than the English novel right now). The last question was the only one that touched on Hofmann’s recent Zweig piece in the LRB – asking whether there were any authors in these countries so well known that they got in the way of discovering other and better writers. George Szirtes asked in return how many Hungarian authors the questioner knew. He knew two, and could think of a third but without remembering his name. I counted on my fingers (I’m an Arts grad, what can I say?) and got to four, but also counting one I couldn’t remember the name of. Szirtes had made his point. The literature’s not so well known it can afford to start jettisoning people just yet. Afterwards, I chatted briefly to Michael Hofmann. I talked to him about Arthur Schnitzler translations (I’m a fan after all); and he recommended to me Tadeusz Konwicki’s novel A Minor Apocalypse as being superb and made some favourable comments about Dalkey Archive Press generally. Hofmann generally seemed very likeable, not at all as you might imagine from his rather passionate LRB article. So, a bit of a departure for me, but a lot of fun. The crowd were mostly on the middle aged to elderly side, but that’s not really a surprise and doesn’t much worry me. As long as the literature’s good, there’ll be readers. And the literature is very good indeed. On a final note, the title of this piece comes from Simon Winder’s description of one of the writers. I forget which. I thought it summed up the literature of the whole region in a way, or at least what appeals to me in it. That’s the joy of Central European literature, it’s gloomy, but it is fun. E.T.A. Hoffman’s Mademoiselle de Scudéri is the earliest Western detective story that I’m aware of. Like many people I’d thought that honour went to Poe’s Murders in the Rue Morgue. Like many people, I was wrong. Mademoiselle de Scudéri was published in 1819, 22 years before Poe’s famous short story. It features an elderly amateur detective, overzealous police so certain of their theory of the crime that they risk a miscarriage of justice, and a series of apparently inexplicable murders. We’re in definite Christie territory here. I heard about the book from Guy Savage’s blog His Futile Preoccupations. He described it here as interesting but disappointing. That was a good warning to have, because I was interested but knowing upfront that it wasn’t a novel to inspire love meant that I wasn’t disappointed. So, what’s it about? Seventeenth Century Paris is recovering from an epidemic of poisonings. A special tribunal located in the Place de Grève has brought the culprits to justice, but using brutal methods. Paris is awash with paranoia and increasingly it’s the tribunal itself that people are frightened of. All this by the way is pretty much historically accurate. Against this backdrop a new wave of terror emerges. While the blood of the guilty and the merely suspect flowed in streams on the Place de Grève, and the poisonings finally became less and less frequent, a scourge of another sort appeared, spreading renewed consternation. A gang of thieves seemed determined to get its hands on all the jewels in town. No sooner had a piece of rich jewellery been bought than it mysteriously disappeared, however well it was guarded. But what was much more terrible, anyone who dared to carry jewels in the evening was robbed or even murdered on the open street or in the dark corridors of houses. Those who managed to escape with their lives testified that the blow of a fist to their heads had struck them down like a thunderbolt, and once they came round, they found they had been robbed, and were lying in a quite different place from where they had been struck. The murder victims are all killed with a single dagger blow to the heart. The killer or killers show an almost supernatural knowledge of when men are going to meet their lovers and all too often those men never arrive or are found dead by their mistress’s house the next morning. Rumours of necromancy and black magic abound, and when a leading policeman nearly captures one of the gang only to see him disappear into an apparently solid wall the population are convinced that the criminals have the aid of Satan himself. The gang are nicknamed The Invisibles and all Paris is afraid of them (all wealthy Paris anyway, the two are often treated as if the same thing in this novel). The tribunal ask for additional powers, the king comes near to granting them, but a short poem of Mademoiselle de Scudéri’s persuades him not to and soon after she is horrified to receive a glittering jewellery set and a letter from The Invisibles thanking her for protecting them. Her intent was just to protect the innocent from the excesses of the tribunal, but now she is involved. I won’t recount the entire plot, so far we’re only around 20 pages or so in, but naturally the police arrest a suspect and naturally Mademoiselle de Scudéri suspects he may be innocent and that a miscarriage of justice is about to occur. Only she can see that truth, justice and good can prevail over deceit, tyranny and evil. And if that last sentence sounded a little melodramatic then welcome to Mademoiselle de Scudéri. It’s German romantic literature. It is melodramatic. The noble of birth tend to nobility of character. Goodness within is reflected in beauty without, evil is generally reflected in ugliness. To be a lover is to be innocent. Or perhaps not. There are subtexts here which suggest things may not be so clear. There are elements of the book I can’t discuss without spoilers but it is fair to say there are darker undercurrents. Paris may be a city of love but it’s also a city of superstition. Mademoiselle de Scudéri may seem to be proven predictably right but it’s not quite that simple. Evil is insidious and part of its power is to make us doubt that which used to seem so certain. Olivier was too disconsolate to speak. He buried his head in his hands and shook with sobs. Finally, forcing himself to fight down the wild grief that had gripped him, he continued his story. Half the conversations in the book take place through tears. Characters swoon a lot too. Some may exclaim. It’s that sort of novel. In a longer work it would get irritating but at this length it’s bearable enough. The plot bears no real scrutiny and depends on the police missing a really pretty obvious connection between all the crimes; the characters are thin; the true culprit is obvious and the explanation for the seeming guilt of the accused man frankly a touch preposterous but then it is the first Western detective novel. These are all accusations one could throw at a lot of its spiritual descendants. Guy ended his review saying that he was sure there were plenty of people who would love this story, but that he didn’t. I’m glad I read it. I found it genuinely interesting as a period piece and as an example of a body of literature (German romantic) that I don’t know that well, but I didn’t love it either. That’s ok, I didn’t expect to. At the end of the day Mademoiselle de Scudéri is a crowd pleaser and I don’t think it’s aiming to be great literature. I think it’s aiming to be just what it is, an entertainment that amuses for a few hours and that tells a good story that raises a few questions in the reader but not too many to be uncomfortable. Mademoiselle de Scudéri. The Hesperus edition comes with an interesting foreword by Gilbert Adair and a fascinating introduction by the translator, Andrew Brown, which explores the darker ambiguities of the novel to very good effect. Despite my reservations it’s of obvious interest for anyone interested in the roots of the crime genre and is exactly the sort of thing I look at houses like Hesperus to be publishing. But books live on, as does man’s eternal thirst for them. Antal Szerb is best known for his second novel, Journey by Moonlight, which was published by Pushkin Press and proved something of a success for them. Before that though in 1934 he wrote his wonderful first novel – The Pendragon Legend. The Pendragon Legend is a hard book to describe. It mixes (and gently lampoons) elements of detective fiction, romance, gothic horror and more in a combination which shouldn’t work but which undoubtedly does. It’s well written, it’s huge fun to read and it’s incredibly playful which just isn’t a word I get to use often enough about books I read. I didn’t actually buy The Pendragon Legend. My wife bought it after thoroughly enjoying his other work (though she hasn’t had time to read this one yet). Even with it sitting on the shelf the book just didn’t grab me though and it wasn’t until I read William Rycroft’s review of it at his Just William’s Luck blog here that I moved it to the top of my to be read pile. A colleague’s envy, when all is said and done, is the scholar’s one reward on earth. Soon however mysterious events begin to occur. Bátky receives a threatening telephone call (the conversation is quoted over at Just William’s Luck, it’s worth reading) and is befriended in the Reading Room of the British Library by an athletic if unlettered young Irishman from Connemara who tells the most extraordinary tall tales and attaches himself to Bátky without delay. Maloney is the Irishman’s name, and it turns out he is heading to Pendragon Castle too in the company of the Earl’s nephew. Bátky is an unworldly sort and though he has some suspicions about his new Connemaran acquaintance the fellow is so likeable that he ends up travelling with him anyway. It sounds cluttered. It sounds too like a Dan Brown plot. 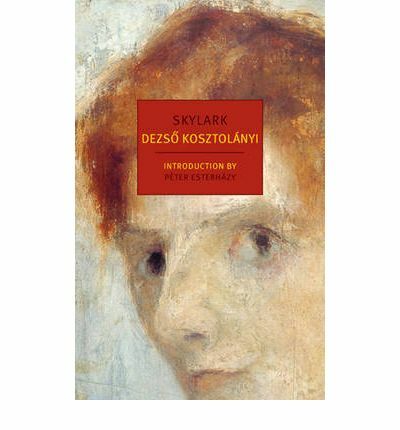 But even though it’s only a little over 300 pages (and that in Pushkin’s Gem format so they’re smaller than usual pages) Szerb’s grasp of pace is such that not only is it not in fact cluttered at all but actually there’s space for digressions and romantic subplots and a great deal of gentle observational humour. The plot is slightly Dan Brownian, but Szerb is well aware of how silly it all is and that’s part of the fun. What in a bad writer like Brown is painful here becomes almost a celebration of human eccentricity and folly. I was filled with the tenderness I always feel – and which nothing can match – when I encounter so many books together. At moments like this I long to wallow, to bathe in them, to savour their wonderful, dusty, old-book odours, to inhale them through my very pores. The novel’s other characters (all seen through Bátky’s eyes) are affectionate stereotypes. Maloney is an entertaining and adventurous fellow fond of rhetoric and stories. The Earl’s nephew is an Englishman so reserved he cannot comfortably sit next to a woman, let alone talk to one. The Earl’s niece is distinctly Welsh and so a committed romantic. Bátky is helped at times by one of his friends, Lena, a buxom and highly efficient German woman with who has a tendency to take control of situations she finds herself in (again, see William’s blog for some wonderful dialogue describing her). They all embody in a way their countries, as perhaps does Bátky himself. None of it is terribly serious. There’s tons of plot, and yet it’s not a plot driven novel. Rather the plot is there because detective novels are plot heavy and that’s one of the genres Szerb is playing with. Equally ghost ridden ancient castles, strange legends and curious inhabitants of remote places are all staples of gothic horror and Szerb plays with that too. Bátky becomes involved with the Earl’s niece, among other women, and his German friend Lena takes a fancy to the Earl’s nephew. There is a perilous conspiracy, misunderstandings and comic escapades, and still there is time for love. It’s extraordinary that Szerb manages to fit it all in so well. I’m obviously not going to discuss the ending or what’s really going on. I can say though without fear of spoilers that in places the book does dabble in darker territories, like the ancient alchemists and mystics Bátky is so fascinated by. There’s a warmth and humanity and a profound sense that we’re all a little absurd running through this novel, but there’s a recognition too that there are parts of us that aren’t funny at all. Szerb lived at a time when irrational beliefs were once again on the rise. Ideas of German nationalism and racial destiny were live issues, and philosophies that belonged in history books were alive and well and being used for tremendous harm. The Pendragon Legend is a comic novel, but it’s one that recognises that myths can be dangerous things. I’ll draw this piece to a close with one final quote. In a piece in the Guardian Nicholas Lezard makes a comparison with Waugh (which he rightly warns should not be overextended). Lezard speaks of Waugh and Szerb’s irony and deadpan technique, and I think this description of the Café Royal illustrates just that quality nicely. The Café Royal is effectively London’s only real café. It aims at Frenchness in every detail. As if the place had been built by Napoleon himself, the grand entrance, the doorman’s cap, and even the cups and spoons are adorned with a capital N crowned with laurel. Coffee is served in glasses; the air is so foul and the chairs so very uncomfortable it’s as if you really were in Paris. It was once the meeting place of the British intelligentsia, and the clientele has remained interesting to this day, consisting mainly of aspiring actresses and clever foreigners. The Pendragon Necklace is translated by Len Rix who has also translated Szerb’s two other novels for Pushkin Press. It’s a translation so smooth you’d think it was written in English in the first place. It’s a wonderful piece of work, and I’d regard Rix’s name on a book as a distinct recommendation. There’s an interesting interview with him here with a Hungarian literature webzine which is well worth reading. The Pendragon Legend. Interestingly, mine had a different cover, suggesting that Pushkin may have reissued it in a new format since the copy I read. Tragically, Szerb is yet another author murdered by the Nazis. As I’ve said before with other writers Pushkin Press have helped me discover, they have my thanks for helping bring him back for a new audience.